The one way to beat quantity is with quality and this is my best butternut squash recipe to date. When you combine the roasted squash with sweet roasted onions, garlicky spinach and a subtly infused béchamel sauce, it’s difficult not to come out on top! In terms of flavour, I highly recommend making your own sheets of lasagne. If you need help with this, follow the detailed instructions here. 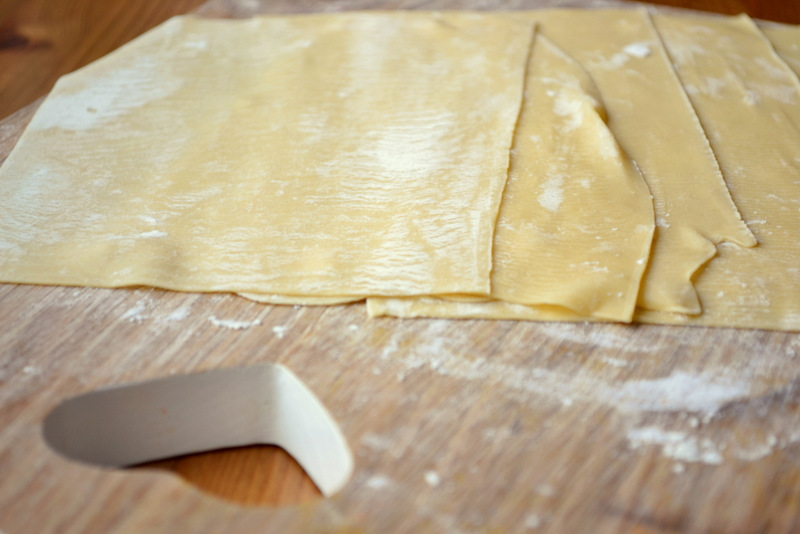 However, instead of making tagliatelle, cut each sheet to the required size. Quite a few of you have been asking about my lighting situation and a proper update will soon be had by all. However, I’ll shed a little light on my current solution – it involves my girlfriend, Katherine, standing by with white pillows which are used to reflect light back onto my food… poor girl. Yet more evidence that slavery isn’t quite dead in Britain. 1. 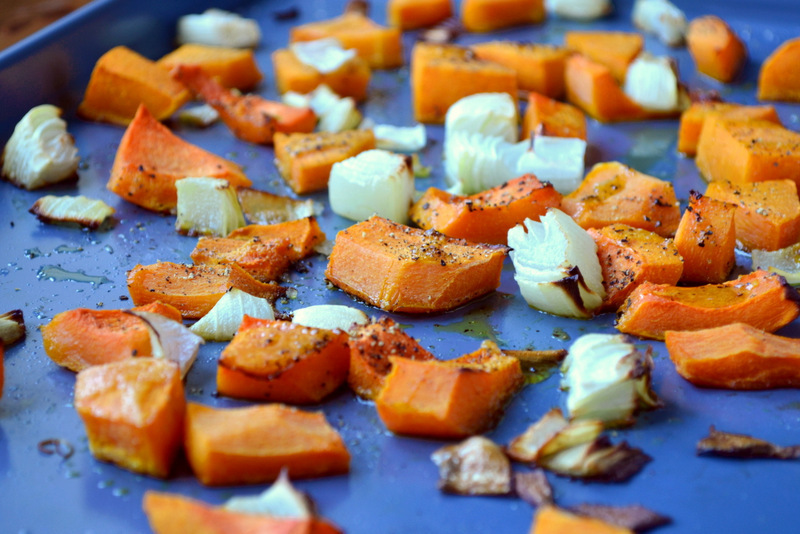 Preheat the oven to 180C and roast the squash and onion with a little oil, salt and pepper until just brown and soft. 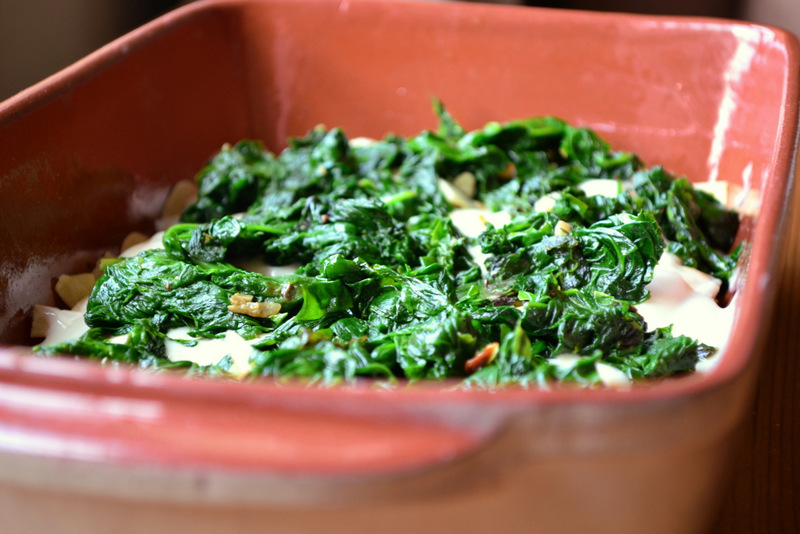 Infuse your milk with the bay leaves, peppercorns and nutmeg by heating them very gently – do not allow to boil. Once the milk has infused (30 mins – 1 hour) strain it and set aside. 2. Melt some butter in a pan and whisk in the flour, cook for 2 minutes. Whisk in the milk, season and allow to thicken. At the same time wilt the spinach in some oil along with the garlic. Squeeze as much liquid as possible from your spinach. Start layering your lasagane – the first layer should be all of the squash. Top this with a layer of pasta, then tip on 1/3 of the sauce followed by all of the spinach. 3. Cover this with another layer of pasta, followed by the rest of the sauce. Top with cheese, a sprinkling of olive oil and a little grated cheese. Add a twist of black pepper and cook for 30-40 minutes until brown. Serve with a side salad. Cost: Since this contains only a little cheese and absolutely no meat, the price will be far lower than a traditional lasagne. Indeed, the entire meal, which can feed up to six people, should set one back no more than £3! Oh you devil! Not only did you beat me to the punchline, you had to top me by adding spinach and your own stinking homemade pasta sheets. Seriously scrapping my draft for butternut lasagna that was scheduled for next week. Nice job, way to make me feel like a loser 😉 (Seriously awesome lasagna Nick)! Haha – sorry, Somer! Please post it! Don’t deprive us! 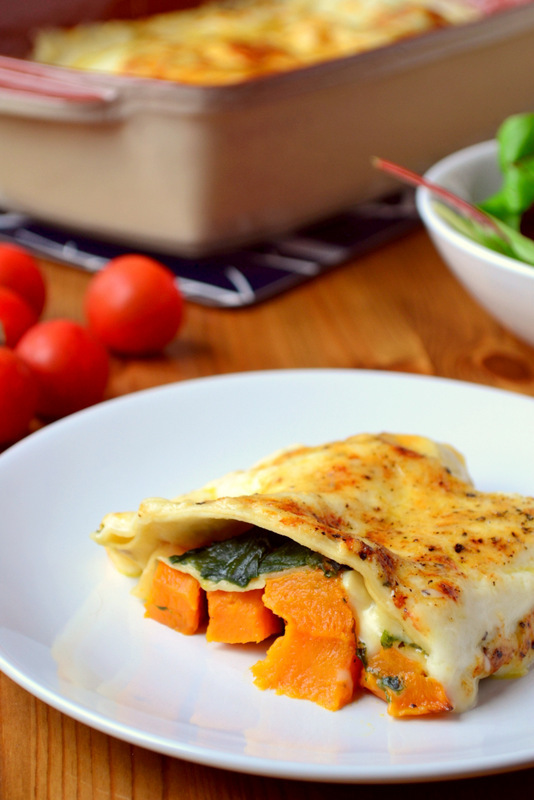 I think I’ll do butternut enchiladas soon instead…. Your chopping board has a heart shaped handle.. 😛 So so cool that you have a pasta roller. I have always thought homemade pasta absolutely MAKES a good lasagna but have never achieved thin enough pasta from rolling by hand. Yours looks perfect! It does indeed! Get a roller, they are pretty cheap and make REALLY great pasta. I think it achieves a smoother pasta too. Thanks! It really is perfect for this season. Oh, this lasagna looks mouthwatering! I share the same love for the butternut squash – just amazingly delicious food! Thanks, Sibella! It really is brilliant, isn’t it? Butternut squash is one of my favourite ingredients too … love this recipe of yours, great combination flavours. I would just like that roasted squash please. Haha – she is rather useful. I love Butternut squash, my kids, not so much. Maybe I can make this as a side dish so they can try it but it is not the main meal. Oh no! Perhaps this will help them to love it! Good idea. This looks delicious not just because of the ingredients used, but because of your photography. What talents! Thanks! Don’t go too over the top, you’ll make me blush. Thanks! It was the perfect way – the most perfect way I’ve found so far anyway. 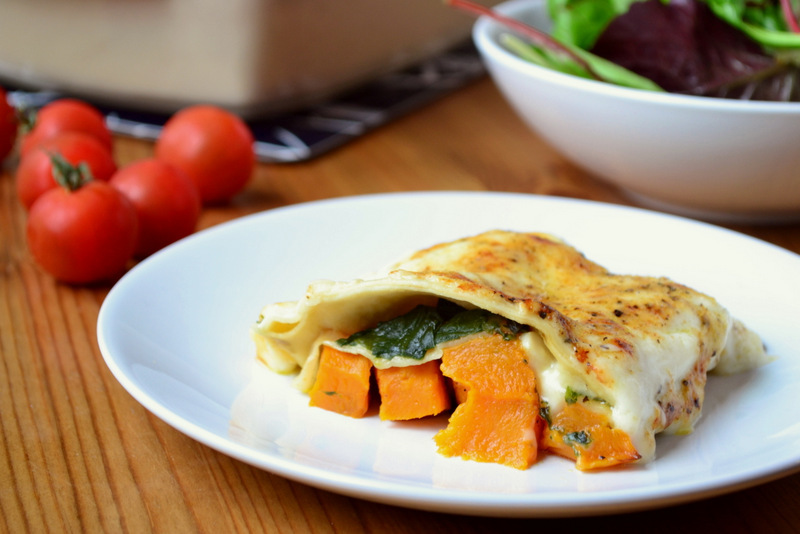 I love butternut squash, and this looks amazing! Yay! Thanks – it was lovely! Looks delicious!!! Plus I saw ur post right when I was going to start cook something! Lovely lasagna! And with fresh pasta no less. Thank you for the reminder about butternut squash – I have also been meaning to give your risotto recipe a try! This looks amazing! I have a butternut squash staring at me from the kitchen that’s in need of some love. This might be just the ticket! Brilliant! Are you sure you didn’t go to culinary school? You are such a natural at putting together such glorious flavors Frugal. If I owned a publishing company… you’d be my first book! Thanks – I’m quite sure. Well, feel free to buy one and offer me that. I’d love to write a cook book. This looks delicious! I’ve been a huge butternut squash kick lately, but this has to be made some time in the next couple of weeks! Yes! Go for it – it was yummy. Thanks, Korena! I’m glad you think so. Reflecting is SO useful! Indeed not, isn’t Somer great?! Thanks – the squash is so pretty isn’t it? Thanks! IT was very aesthetically pleasing! You’ve done it again – created a fabulous dish and entertained with your lovely way with words. It’s always a pleasure reading your posts! Haha – thanks, Cathy! More soon! I love butternut squash! This looks amazing!!! What a nice mix of flavors and color. Beautiful pictures and this recipe has all my favorite ingredients. Can’t wait to try. Thanks! It was delicious, I can’t wait to make it again. 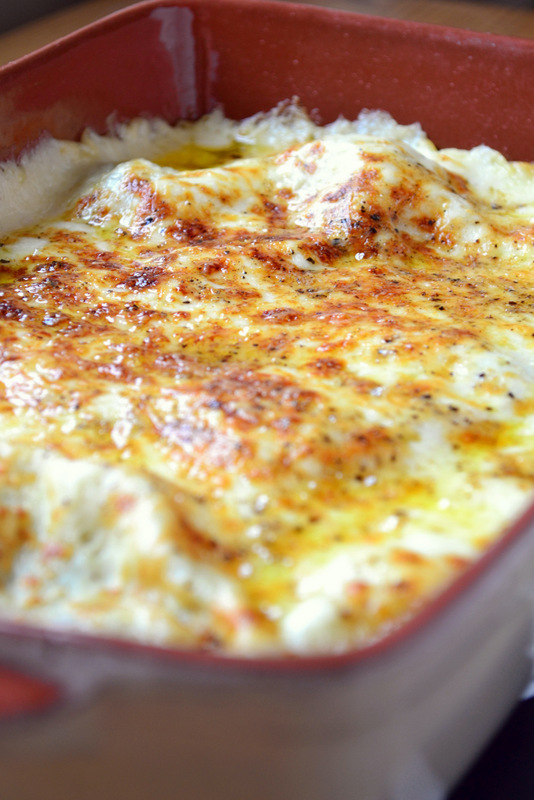 This is a perfect lasagna; love it! Indeed – the unsung heroine of frugalfeeding! I have two 6-pound butternut squashes just looking for a good recipe; thank you! Love the image of your girlfriend holding pillows to reflect light for your photography. The things we crazed bloggers put our significant others through for the sake of our art! Amazing! This blog was made for it :D. I am definitely a crazed blogger! I’m sure you could! I never use kitchen lighting, but I don’t really want a light box either. I need to source some nice linens too. Thanks! Yes, do make it – it’s lovely. I make a similar dish and it is always a winner, even with my cannot-live-without-meat husband. Great pics! Fantastic! It just works so well. Awesome! You should give it a go! She’s the washer up too :D. I’m not a bad person. I’m getting a better reflective source soon. What a great fall recipe. Katherine did some fine pillow holding here. Oh I didn’t mean here. I meant there. That came out the wrong way! I’m a fan of butternut squash and always on the lookout for new ways to enjoy it. This looks fabulous! Thanks – I adore the stuff. It has such a great taste. And your girlfriend is a real trooper! She is indeed. It is very good, Daisy! Hope your life is equally pleasing at the moment! You have amazing lasagna cutting skills. That is a neat slice! This lasagna looks fantastic! What a delicious combination of ingredients! Thanks! Yes, it all worked so well! What a gorgeous vegetarian dish. I’m coming over now.